Woo hoo...Friday has arrived (can you see me doing my party dance? No? Just trust me, it's good) and I am donning one of my favorite skirts worn here as a dress. I always feel like twirling with this tail hem baby on...just puts me in that kind of mood! And the white with the emerald green is a total winning color combo for me. It's safe to say I'll be twirling my way into the weekend! the gold necklace looks great with the green top! You look fantastic in that emerald green, and adore the hem detail on that skirt! Love the look! The layered necklaces, the emerald green blouse, the shoes! White and emerald green is always a winning combo - I love the shirt! Wearing a skirt as a dress... clever! White is so trendy now. I love it. I am doing my Friday happy dance too! Thanks for your comment, you will definitely be seeing more DIY's! Have a great weekend. I like the color combination too! such a fun skirt! love the short + long length! Gorgeous, love the long tail hem on the dress, it looks amazing flowing around you, and the green top looks beautiful with the white, love the layered necklaces, too. Great look! This is gorgeous! Love this! Happy weekend twirling! You look great in this and I love the color combo--after years of avoiding green, I'm really loving it paired with white and blue. Hope you have a wonderful weekend Nicole! i love these two colours together!! i really like the skirt! is so cool that is longer on the back! Lookin' gorg girlfriend... love this... green looks fab on you and I love those neutral Loubs and the cut of your skirt! You probably know that I'm crazy for anything with a high low hem so LOVE THE SKIRT! Check out my blog whenever you get a chance! I am doing a feature on a great new band, and they would love your support! Girlfriend, you look so gorgeous! I love this shade of green- it's so vibrant. Perfect outfit for staying cool in this heat. I love that you wore the skirt as a dress--it's super pretty! Loooove this skirt on you! So pretty! And loving the green also! Happy weekend, love! oHHH i loved that you wore your white dress as a skirt!! i thought it was a skirt atfirst.. i love that it's asymetrical!! 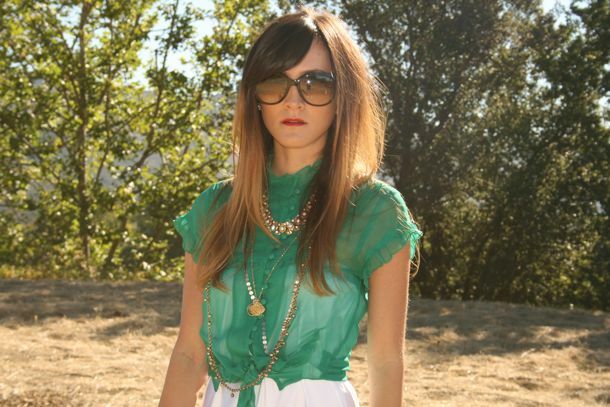 ADORE the see through green blouse that green is such a gorgeous color! So cute! I love the flowy white dress/skirt. It looks so nice and fresh with a green shirt. You have done it again little girl!! love those colors and of course the accessories. Looking forward to more!!! Fabulous, I love how You transformed your dress in to skirt. Emerald green with white looks amazing. I would never thought about this combo. Yeah, live an learn. Haha! Your shoes are so gorgeous.Wow! loving them. Thanks hun! Have a great weekend You too! Just tried to buy it, but it's sold out in white. Boo. GORGEOUS look. Loving the emerald! This is such an ingenious outfit, Nicole! The skirt as a dress looks SO flattering and the hem line seriously falls perfectly and looks feminine and breezy. And the tied bright green top is the perfect touch. skirt/dress whatever it is ...ITS TOO FABULOUS!!! Love it...the picked up hemline in the front is one of my favorite looks right now. And green and white always make a really strong pairing. You have gotten it right AGAIN! inspiring how you wore that skirt as a dress! great jewelry as usual! ou have a cool blog! I love that you wore the skirt as a dress! The hem is so flirty and fun and the splash of green is so pretty! I love the color combo you have going on and that necklace is awesome! Love that you wore the skirt as a dress - I'll have to try that sometime! And the emerald green top is gorgeous! I'm in awe over your high-low hem skirt. Seriously amazing. It's the best of both worlds - a mini and maxi in one. Also love how you're creatively wearing it as a dress. love how you layered the blouse over the dress... fab!!! looking good. i'm actually in la right now... let's play next time i'm out there. wow,love that combination = green and gold jewellery!! !u inspired me babe! That skirt is amaze, honey. A the sheer top over it is so clever! You are so creative...it's inspiring! The necklace is so great!